Ensure that the HBP's work is undertaken responsibly and that it benefits society. More information on the HBP's Flagship Objectives is available in the Framework Partnership Agreement. The timeline of the Project is split into multiple phases, each of which will be covered by a separate funding agreement. The current phase is Specific Grant Agreement Two (SGA2), which spans the two-year period from April 2018–April 2020. The HBP is funded via several sources. Total funding is planned to be in the region of EUR 1 billion; around one half of which will be provided by the European Union, and the other by Member States and private funding sources. The European Union contributed EUR 54 million to the Project in the Ramp-Up Phase (October 2013 to March 2016), EUR 89 million for the second phase (SGA1), and EUR 88 million for the current phase (SGA2). The FET Flagships Staff Working Document provides further information on how Flagships are funded. 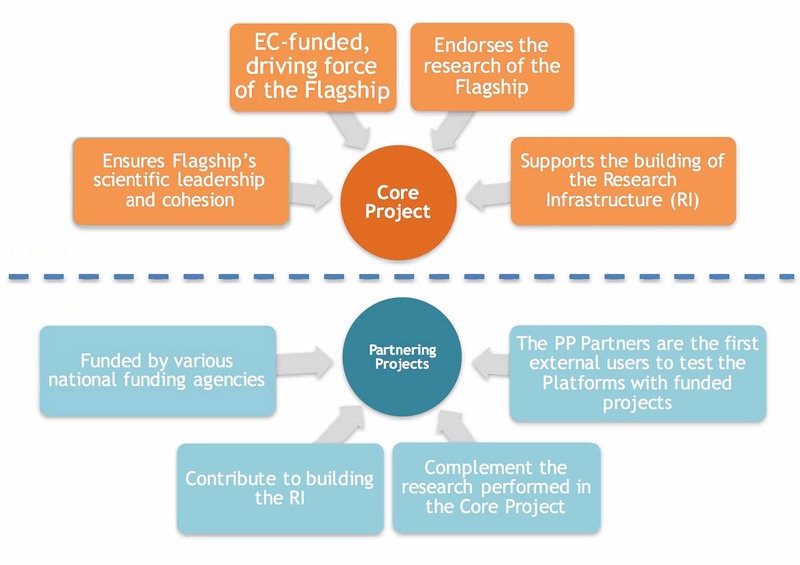 The Flagship model is made up of the Core Project (CP) and Partnering Projects (PPs). The CP is funded by the European Union, and is the driving force behind the Flagship. It ensures the Flagship's scientific leadership and cohesion, and supports the building of the Research Infrastructure. The PPs are an integral part of the Flagship. They are financed by various national funding agencies, and complement the research performed in the CP. 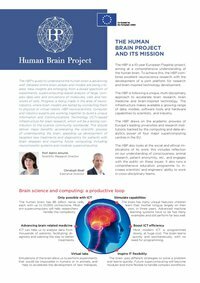 They also contribute to building the Research Infrastructure, and provide the first external users to test the HBP Platforms with funded projects. In the Flagship model, the research community drives the process of defining and selecting the grand challenge of the Flagship, and developing the related research roadmap. Further information on FET Flagships is provided here. Video made by TRICKLABOR for Forschungszentrum Jülich and the Human Brain Project.